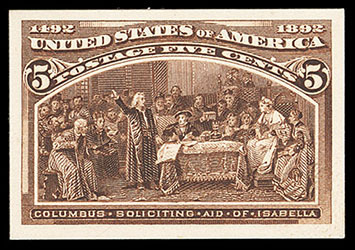 1893, Columbians, 1¢ to $5 complete, plate proofs on card, large even margins and rich vibrant colors throughout, accompanied by original envelope (and rare thus), an Extremely Fine set. 1893, Columbian, 2¢ brown violet, neat cork cancel, precision centering amid large beautifully balanced margins, rich bright color, Superb, an exceptional used gem; with 2019 P.S.A.G. certificate Graded (98, SSV $375). 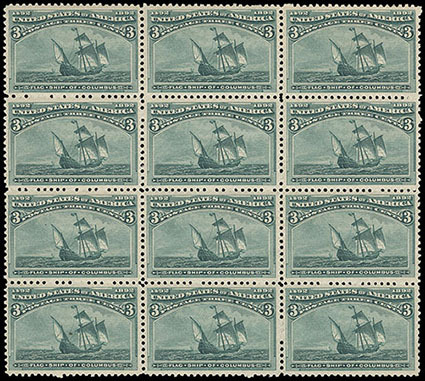 1893, Columbian, 3¢ green, o.g., never hinged, recision centering within large evenly balanced margins, stunning deep rich color on bright fresh paper, a Superb gem, to date only nine stamps have graded higher; with 2018 P.S.E. certificate Graded (Superb 98, SMQ $2,000). 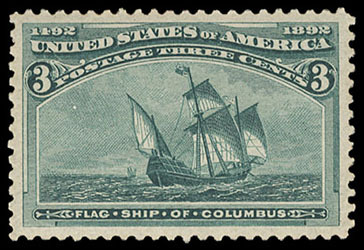 A MAGNIFICENT NEVER HINGED GEM EXAMPLE OF THE 1893 3¢ COLUMBIAN ISSUE. 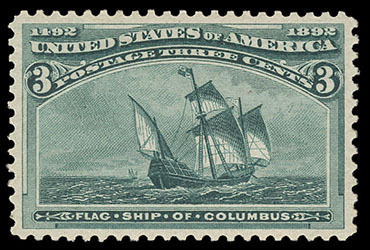 1893, Columbian, 3¢ green, top margin plate number single, o.g., never hinged, exceptional centering amid wide evenly balanced margins, rich bold color, Extremely Fine to Superb, a gem plate number single; with 2012 P.S.E. certificate Graded (XF-Sup 95, SMQ $750). 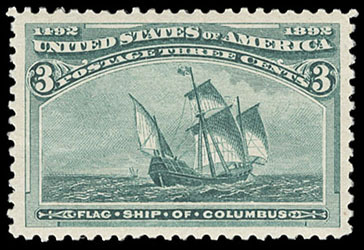 1893, Columbian, 3¢ green, o.g., never hinged, exceptional centering amid wide margins, rich vibrant color on bright fresh paper, Extremely Fine to Superb, a stunning large margin gem; with 1993 P.F. & 2004 P.S.E. certificates, latter Graded (XF-Sup 95, SMQ $750). 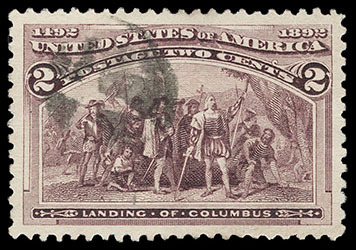 1893, Columbian, 3¢ green, o.g., never hinged, perfect centering amid beautifully balanced margins, rich deep color and exceptionally fresh, Extremely Fine to Superb, an outstanding gem; with 2004 P.S.E. certificate Graded (XF-Sup 95, SMQ $750). 1893, Columbian, 3¢ green, o.g., never hinged, large evenly balanced margins margins and precise centering, rich bright color, Very Fine to Extremely Fine, a lovely never hinged gem; with 2009 P.S.E. certificate Graded (XF-Sup 95, SMQ $750). 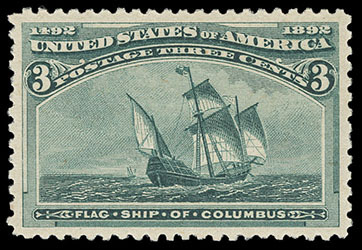 1893, Columbian, 3¢ green, block of 12, o.g., never hinged, nice allover centering, fresh with rich color, Very Fine. 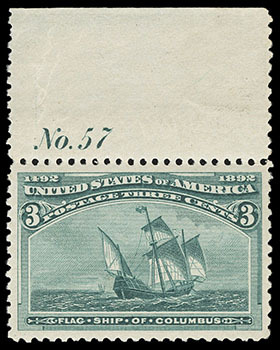 1893, Columbian, 4¢ ultramarine, block of 12, o.g., top center stamp lightly hinged, others never hinged, wide margins, strong bold color, F.-V.F. 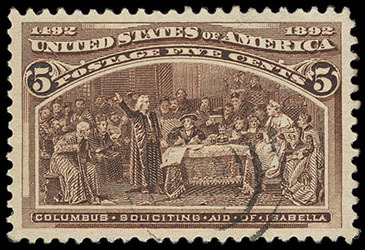 1893, Columbian, 5¢ chocolate, light unobtrusive target cancel, rich vibrant color enhancing a proof-like impression, large even margins and precise centering, Superb, a stunning used gem; with 2019 P.S.A.G. 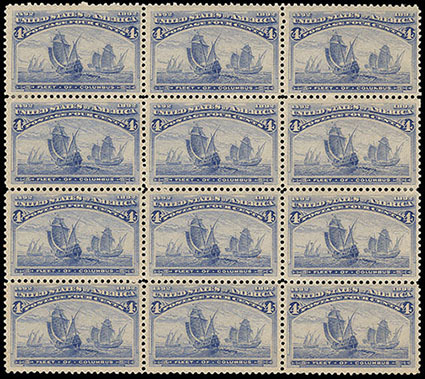 certificate Graded (98, SSV $775).